Bart Ebben supplies used car parts Peugeot 605 worldwide as a professional cardismantler specialised in Citroen and Peugeot second hand car parts. In our stock you can find more than just an engine or a gearbox. Interested in what parts we stock? You can find all common Peugeot 605 used car parts easily in our online catalogue. Auto parts for Peugeot 605 can be found as well. Our large stock contains more than just engines and gearboxes. We can deliver an airbag, an ECU or a front bumper just as well. Our stock covers nearly every Peugeot 605 used car part you can think of e.g. electrical parts like Airbags, throttle bodies, sensors, relais, ECU engine management computers, heater fans, steering pumps etc. Or body panels like doors, bonnets, bumpers or mirrors and interior parts like seats, seat belts, a dashboard or heating control panels, etc. Interested in all our parts? By far the easiest way to get Peugeot 605 Auto parts is to send us a part request or give us a phonecall. 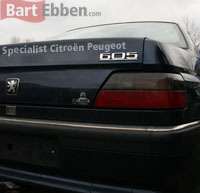 Worldwide Peugeot 605 used car parts shipment is what we arrange every day. After we have received your part request our salesmen will double check that the selected Peugeot 605 spare parts second hand or new will fit your car. After your orderconfirmation our careful packaging process will start, we only ship our parts with selected and highly experienced, automotive shipping companies.